Jaded Blossom: Grand Slam Birthday! Hey, it is Melissa and today is my turn to be here on the Jaded Blossom Blog!!! Yay! I feel like I have been so out of touch with everyone with all the packing last month and my move a couple of weeks ago, but I am so super excited to be back home. Thanks to everyone who asked how things went!!! In honor of being back, I had to make this card for my DT project today!!! I'm sure I have already mentioned this, but I really love the Sport Dies that came out this month. I also used the new Hey Batter stamp set and the Card Mat Dies on this card. I traced the Royals logo using my Cameo software. I've already been out to the ballpark since arriving home. We moved back here from Cleveland and the Royals were playing the Indians the night I went to the game. Too much fun - especially since my Royals won that night. My son's birthday is Wednesday, but we will have to wait until next weekend to celebrate as he is at camp for the week. This will be my start to transforming him into a Royals fan. I am also working on my husband!!! Hope you like the card. 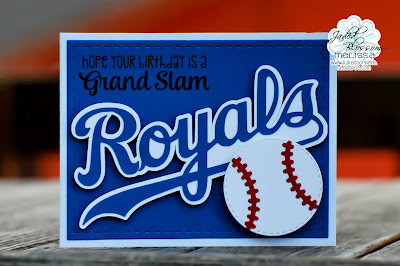 It would be an awesome card to make with any team's logo to give to your favorite baseball fan! Love the card Melissa! Glad your move went well. Sounds like you are pretty excited to be home!! Hey batter batter! That's a ca-ute card! Hope you're settling in quickly! Chocolate and Peanut Butter, Yes Please! Water colour with Jaded Blossom! Jaded Blossom Guest Designer: Beckie! Jaded Blossom June Sneak Day 3! Jaded Blossom June Sneak Day 2! Jaded Blossom June Sneak Day 1!